Just 3-4hours flight from Lahore & Karachi, you have everything there! Our Package is designed for extra-ordinary experience in Sri Lanka. Nature Explorer Lanka is backed by field experience of our Sri Lankan staff and supported by Saiyu Travel Company headquartered in Japan and Pakistan. We aim to be a worldwide leader in the tourism industry and provide the best service offerings to all nature lovers and specifically to our Pakistani customers. Our Managing Director, Mr. Anuradha holds a decade long experience in the tourism industry and is enriched with geographical knowledge of Sri Lanka. 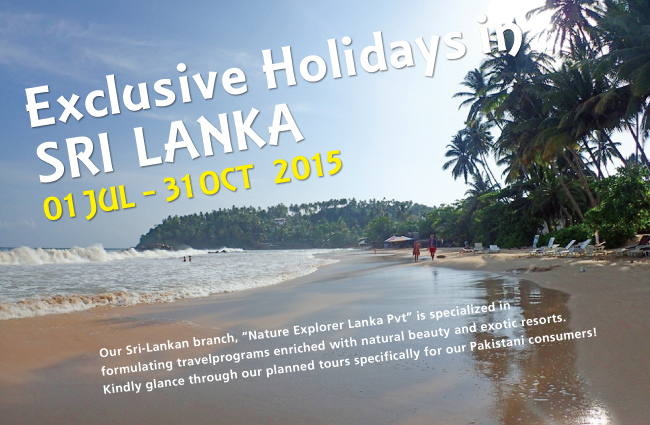 Negombo Beach, Sigiriya Rock and Kandy and Elephant ! Negombo beach, Sigiriya Rock, Kandy… Train Ride to Hill station! Negombo beach, Sigiriya, Snorkeling & Dolphin Watching at Trincomalee ! Luxury stay at Jungle Beach Hotel. Sigiriya, Kandy, Train ride to Hill station –Nuwara Eliya, Mirissa Beach at South coast…. Sigiriya, Kandy, Train ride to Hill station, Snorkeling & Dolphin watching at Trincomalee ! Sigiriya, Kandy, Train ride to Hill station, and East & South Coast beach of Sri Lanka !! >> Kindly get in touch for the best price for your group. We are flexible enough to plan the trip on a very affordable cost.